Besides striking looks, our Thorn SoCal R/S is loaded with notable & nifty technical items. That's right! Beneath the gold sparkle is a black limba body joined by a special dove-tail lap "Precision Lock" bolt joint to a black painted maple neck with bound rosewood, inlaid with mastodon dots. And dig that heel contour! "Got yer friggin' dots right here, pal!" Pickups and even the trem/bridge are made by Thorn. Dunno whose tuners, but they're staggered/locking, with no string trees in sight. No fret size specs noted either, but they look rather hefty in some pics. Big G&G case is included. 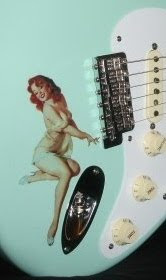 Listed by Sk8ter-boyz-Guitars-N-Collectibles in Georgia, this guitar is pre-owned and comes with lots of case candy. Cool inventory at the boyz overall.